craftytammie: you put your peanut butter in my chocolate! we have our december guild meeting tomorrow. we'll be getting our swap pincushions, madrona road challenge fabrics, playing a mystery game, and hopefully noshing on lots of yummy treats. october and december birthdays are responsible for the snack table. i've been trying to come up with something really tasty to bring. i was thinking ritz/peanut butter cookies. 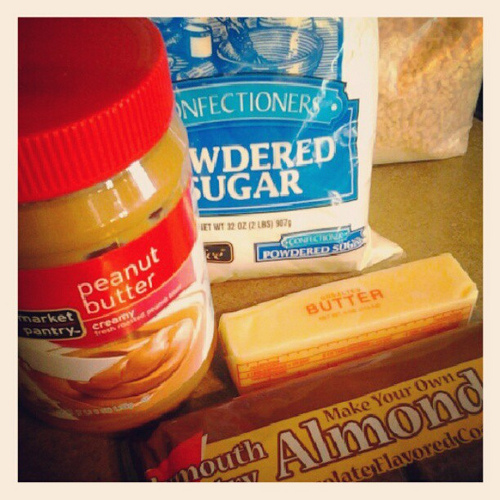 make some pb cracker sandwiches and then give them a dunk in melted almond bark. i hear they're awesome frozen too - i've got a bag chilling right now so i'll report back. 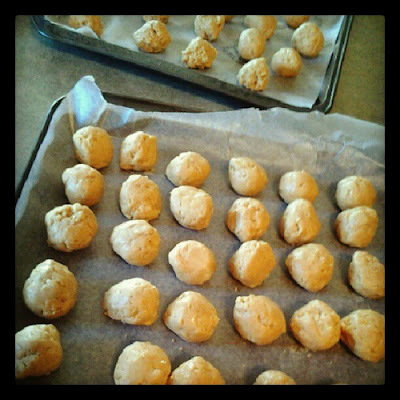 then monday my cousin steph posted about grandma neppl's peanut butter balls on facebook. 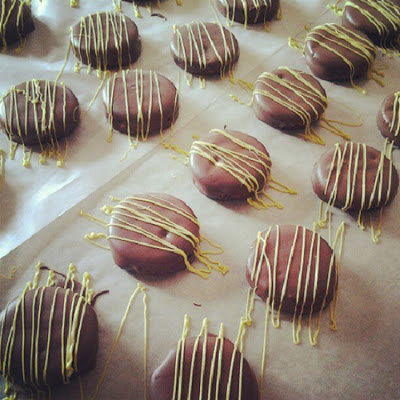 i got the recipe and made them yesterday, and they are also super easy and delish! it seems they are also called buckeyes? one aunt doesn't remember there being rice krispies in them, and i suppose you could leave them out, but i like the crunch! 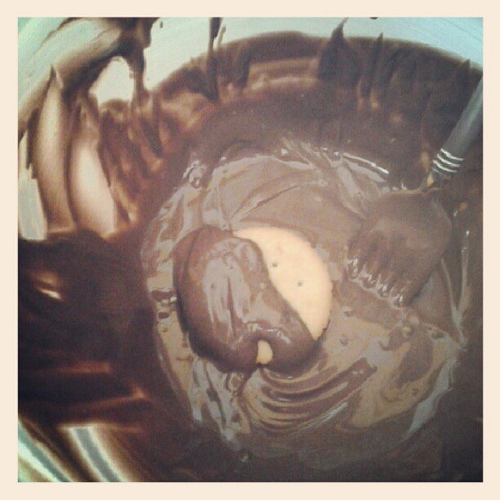 The next day, melt the paraffin (a few pieces) then add in the chocolate chips. Dip each ball into the mixture. Put them on a wax-paper lined cookie sheet and EAT! when i posted the above pic on facebook i got lots of requests for the recipe, so i posted it there. someone asked about the paraffin. you can buy food grade paraffin for candy making, it helps the chocolate set and makes it shiny. but if i'm dipping something in chocolate, i always use almond bark. wilton also makes candy melts that are for dipping, so you could try those. i'm sure there are other methods, but i've got mine and it works every time! helpful tips: i use a small scoop for forming the balls, and my batter bowl for melting the almond bark. then i use a fork to help coat them in the chocolate and lift them out, tap against the side, and lay it on a piece of wax paper to harden. now, you can get all fancy pants and drizzle either recipe with melted white chocolate and sprinkles (random fact, my husband hates sprinkles. i didn't know that was possible, but he says he does). 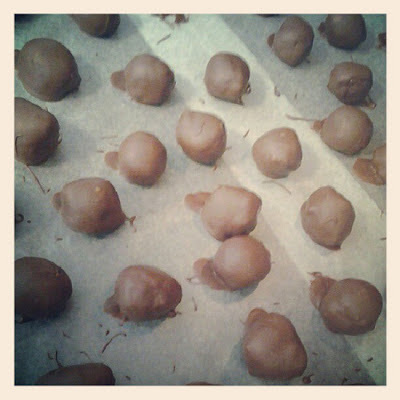 or you can eat the peanut butter balls without any chocolate on them, that's good too. in fact, i can't even tell you how many the recipe actually makes because i ate them as i was scooping them. but it's something like 70ish. hope you enjoy these quick easy recipes! 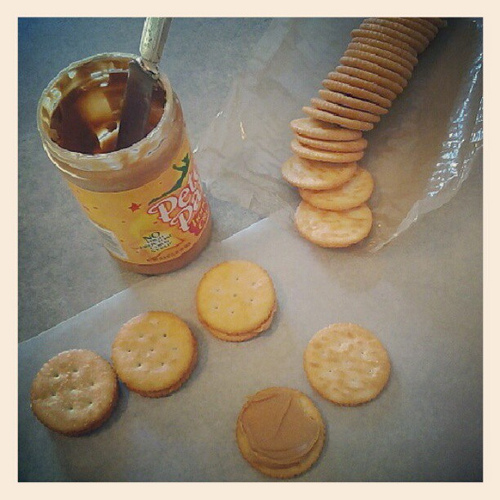 PB and chocolate are number one priority. for me.